1. Put the squid in a bowl and cover with the milk. Set aside for 20 minutes. 2. For the mayonnaise, blend the egg yolk, basil, mustard and vinegar in a food processor; season. Mix the oils and, with the motor running, slowly trickle them in to make a thick mayonnaise. Add lemon juice to taste; season and chill. 3. 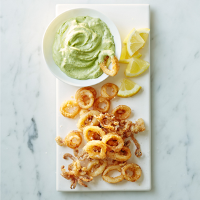 For the calamari, mix the flours and baking powder in a large bowl; season. Shake the excess milk from the squid and toss through the flour until coated. 4. Fill a large pan 1 / 3 full with oil and heat to 180˚C. Shake the excess fl our from the squid; fry in batches, for 2-3 minutes, until golden. Drain on a rack set over a tray. Season; serve with the mayo and lemon. This recipe was first published in Wed Aug 12 09:20:00 BST 2015.